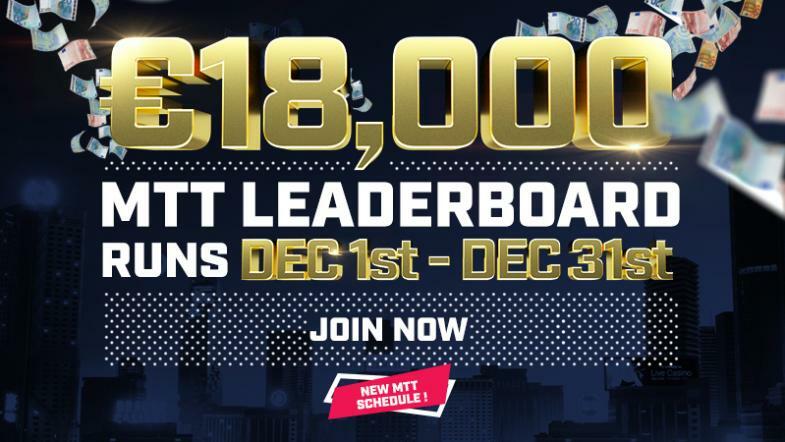 What better way to end 2018, than with an €18,000 MTT (Multi-Table Tournament) Leaderboard? The year ‘18 is auspicious and a signal for change, not only for HighStakes and our business, but for you as a player. Do you have the heart and commitment to fight, compete and end the year the way you intended to end it when you started? Like all MTT Leaderboards before, this leaderboard will be updated every 30 minutes via live feed. All Tournaments of €500 and less will be counted towards the leaderboard. All MTT’s above this level will not influence leaderboard points. Prizes will be paid out before January 5th (05.01.2019.) and paid directly into players main wallet. In the event player wallet is not Euro currency, the standard HS exchange rate will be used which can be found on the footer of each page of the website. Prizemoney can either be used to buy into any HighStakes tournament and can then be withdrawn or the user can generate rake of 15% of the prize amount playing other games on HighStakes Poker.